You can customize this dish with whatever vegetables are freshest and in season in your market, and whatever fish is freshest and available in your area. Cod, sablefish (aka “black cod”) or even sole would work well in this prep, though for a thin piece of sole I would recommend reducing the cooking time by ~5 minutes. I used fresh white corn, kohlrabi, spring onion, carrot and cherry tomatoes, but almost any vegetables would work. Zucchini, spinach, scallions, peppers, snow peas, asparagus, and leeks would all be excellent as well. You can also make adjustments to the herbs and flavorings that you use. I used lemon, white wine, earth balance and thyme. Olive oil, lime, basil, cilantro, vegetable broth, orange, olives, capers, and parsley are other flavorings that could be used as well. The traditional method for making the parchment “wrapper” for this is to fold a large piece of parchment in half and cut it into a heart shape. Starting from the top of the heart, you fold and crimp the parcel closed. Here is a video that demonstrates the folding technique. It’s important to keep the package closed tightly enough to hold the steam in, that’s what cooks the fish and vegetables inside. If you can’t get the parchment to close tightly, I recommend using a few strategically-placed staples. 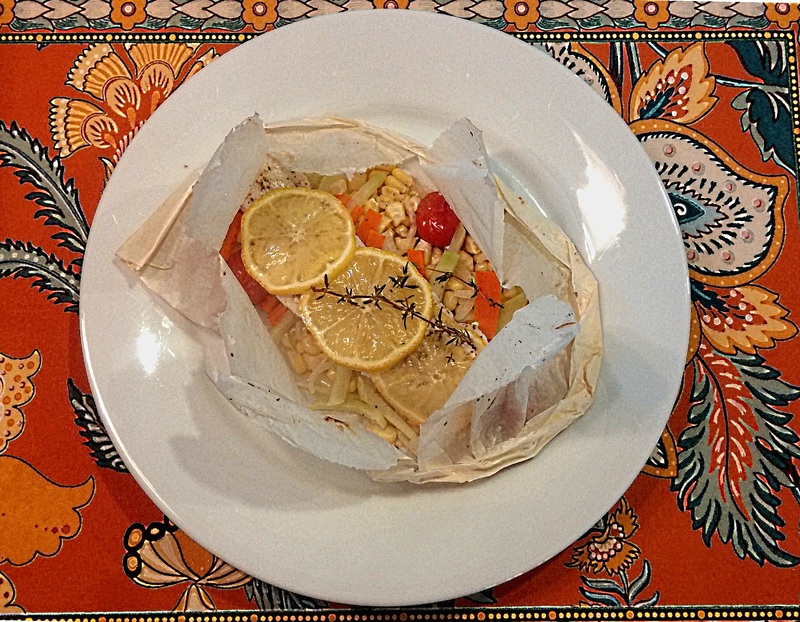 A simple, quick and delicious way to prepare fish and fresh vegetables. 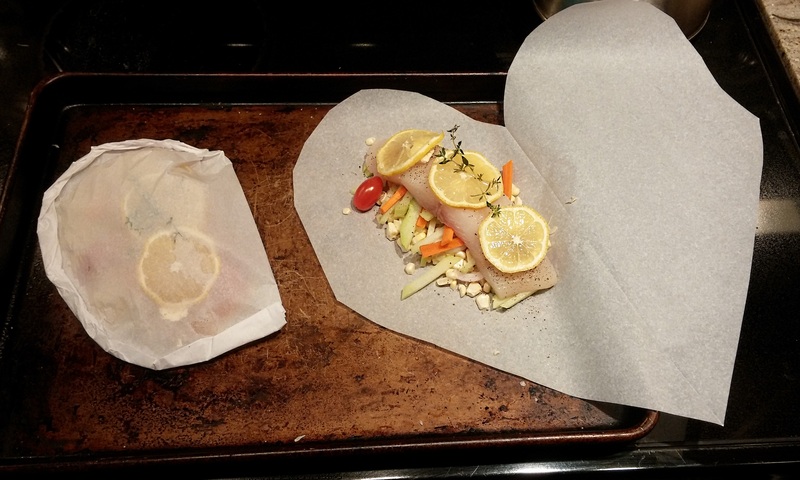 Cut two large hearts out of parchment paper and place them on a baking sheet. On one side of each heart, place onion, corn, kohlrabi, carrot and tomatoes in a mound. Lay halibut fillets on top of vegetable mound and season liberally with salt and pepper. Place 3 lemon slices and a sprig of thyme on each piece of halibut.